We produce and supply standard “HOE of KY” construction site castings and fabrications to contractors for projects throughout the Kentucky/Southern Indiana region. The “HOE of KY” brand is present today on tens of thousands of street castings across the region – a mark of their quality and durability. We are also capable of producing custom construction castings and fabrications, which we can design and produce in-house. We are an American Institute of Steel Construction (AISC) certified fabricator with a strong resume of successfully completed projects throughout the eastern U.S. We design and fabricate steel, stainless steel, and aluminum for major infrastructure projects using state-of-the-art design software to yield our products accurately and efficiently. Check out some of our recent steel projects where we have provided fabricated steel, stainless steel and aluminum for jobs throughout the eastern U.S. Roads, Bridges, Light Rail, and Tunnels – we’ve supplied structural steel and miscellaneous metals for all things infrastructure over the past three decades. The quality of our structural steel work is guided by our focus on quality, safety, flexibility, and customer partnerships. We supply bridge components in mild steel, stainless steel and aluminum, as well as produce gray and ductile castings for scuppers, walkway posts and architectural castings. We are a respected single-source producer of quality gray and ductile iron castings in a diverse range of sizes, weights and configurations. We offer an extensive range of manual and Computer Numerically Controlled (CNC) machining to turn quality castings into finished parts. Whether the size is small or large, or the quantity low or high, casting quality comes first at J.R. Hoe. We have the single source advantage for casting and machining capabilities, as we can process any customer order from concept to finished product under one roof. We use the latest technologies for design concept, pattern making and iron casting to manufacture our cast iron products. Our castings and fabrications are American manufactured, and therefore support American families and help strengthen the foundation of the United States economy. We design, produce and supply a variety of iron architectural castings for a wide range of outdoor projects, such as building exteriors, parks, shopping centers, city streets, athletic fields, theme parks and more. 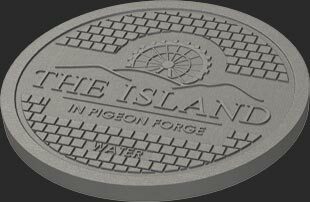 Our products include downspout boots, bollards, decorative trench grate, manhole covers and other custom casting requests. With a focus on sustainability and green infrastructure, we design our architectural castings with optimal functionality and aesthetic appeal and are happy to work with architects, engineers and contractors to cater to the needs of any project. Our cast iron and fabricated steel bollards are offered in a variety of sizes, materials, colors, and installation methods. Our style options can enhance new and existing outdoor spaces for both security and ornamentation, depending on their application. J.R. Hoe cast iron downspout boots serve as an attractive architectural feature that enhance the integrity of any building. Where plastic downspout boot connections and fabricated steel downspout boots often devalue the appearance of a building, our downspout boots combine a sleek design with the natural aesthetic of cast iron. J.R. 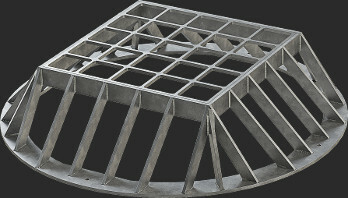 Hoe decorative trench grates are offered in a wide range of unique and attractive designs that can be used in paved areas such and parking lots and urban and commercial developments. J.R. Hoe offers a variety of products ideal for Green Infrastructure applications to lessen the burden of stormwater volume on our underground systems. We regularly work with engineers and landscape architects in developing products that fit the Green Infrastructure requirements of any project. J.R. Hoe is a U.S. manufacturer of quality iron casting and fabricated steel products. Gray iron and ductile iron castings made in our iron foundry in Middlesboro, Kentucky and serve in the pump and valve, construction equipment, aluminum smelting, and many other industries. 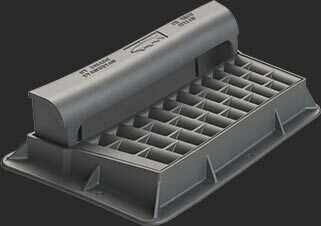 We offer casting machining to produce OEM parts for manufacturers, which are shipped globally. In addition, we produce our own line of HOE of KY construction castings and fabrications specified by engineers for street and highway construction projects throughout the region. J.R. Hoe is also an AISC steel fabricator, as well as stainless steel and aluminum. We supply domestic materials to regional infrastructure projects such as transportation, power plants, military bases, river lock & dam projects, and water treatment plants. Our structural steel and miscellaneous fabricated metals have recently gone into major infrastructure construction projects in Kentucky, Virginia, North Carolina, Georgia, Florida and Tennessee. J.R. Hoe is a HUB ZONE certified supplier.